South Grove Primary School - What have PLM been up to this Term? In PLM we have been learning about Ancient Egyptians. We had a visit from the Rainbow Theatre group who acted out the story of Moses. The children enjoyed joining in and acting out parts of the story. We also enjoyed making Egyptian Thrones in Design Technology. 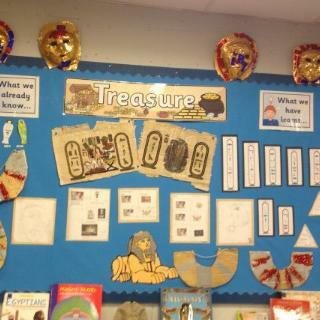 We have had fun learning about the Ancient Egyptians, King Tut and all the treasures that were found in his tomb. In English we have been learning our phonic sounds and practising our spellings. We have had fun reading and writing stories using pictures to help support our writing.